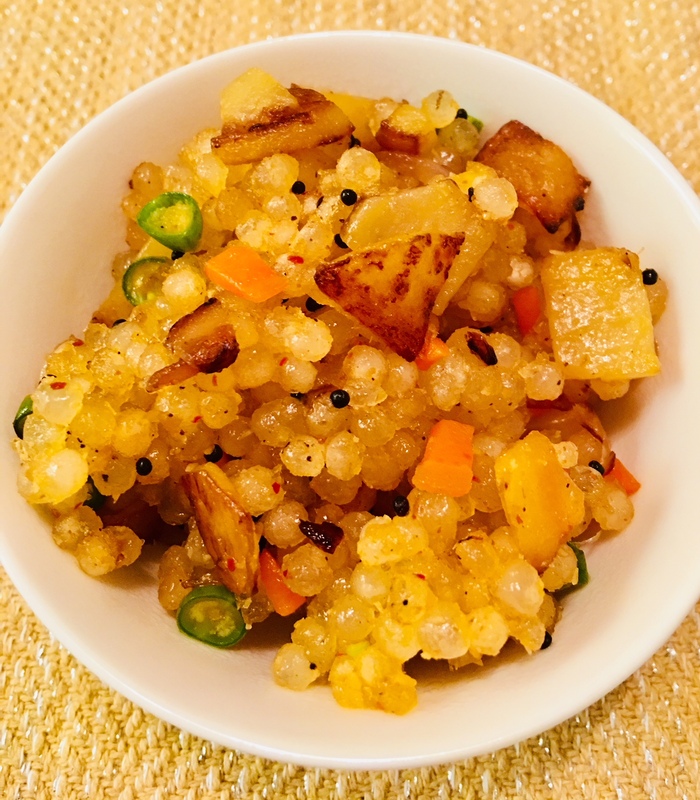 Sabudana khichdi is usually made with peanut powder which is a dish that is consumed during auspicious days by those that want to observe abstinence from indulging on their staple food. Though I’m not a religious person (to my mom’s disappointment!! ), I love Love laaaaav sabudana khichdi. However, since i’m on Whole30 cleanse now, I wanted something, Anything other than eggs and sabudana khichdi came to mind. I knew I had to tweak it to make it Whole30 compliant which wasn’t that hard. I just had to get a little creative with it and the end product was delicious. I call this a “Hodgepodge” not only because i like the sound of it 🙂 but also because basically anything goes when you make khichdis and its a one-pot whole meal. 1 cup Sabudana/Tapioca pearls Soaked in 1 cup of water for 4 hours. Heat ghee in a skillet on medium high. Throw in mustard seeds and wait for them to pop. Add potatoes and roast till golden. Add shallots and fry a little bit. Throw in veggies and asafetida and stir. Dump the ground paste with veggie mixture and mix well. Cook covered on low until moisture is completely absorbed by veggies. About 2 minutes. Dump soaked sabudana to the mix, add salt to taste and mix to combine. Cook covered on low until sabudana is cooked and shiny. About 5 minutes. Stir every now and then for even cooking.